4 identical games with tournament signage/scorekeeping. Basketball or Football available. 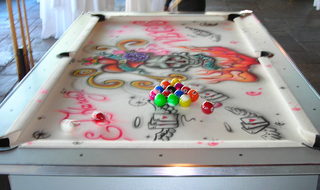 Turning the parlor classic into a gorgeous piece with a customized play surface, the graffiti pool table can be altered to fit the theme of your next event. Cool! 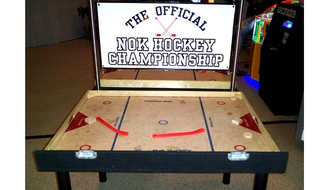 The camp and playground favorite, Nok Hockey, is available for your next event! The object of the game is to knock the puck into the opponent's goal. For the goal to count, the puck must go completely through the slot. It is possible to take a direct shot into the goal, but more often, a player must bank the puck off the wall, corner or goal block. The classic parlor game, ping pong, is a light-hearted game approachable by all ages! 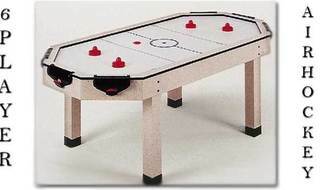 Now, enjoy the fun on a scaled down table adding more fast-paced action to the game! Perfect for venues with limited space. 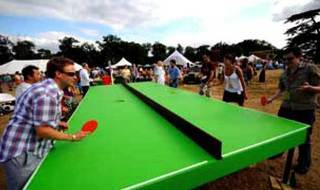 Up to 16 people can play simultaneously in the Group Ping Pong game. Fun for everyone, let the frantic paddling begin! A classic parlor game with your creative vision brought to life by us! 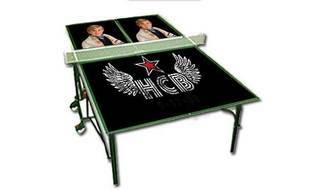 We can put your event logo, photos, you name it on to the table top. Round table takes the classic game to the next level by creating a more interactive experience with up to 6 players sinking the eight ball! SWISH! Great for kids and adults, Super Shot Basketball features a moving backboard for the ultimate hand-eye coordination skill test! 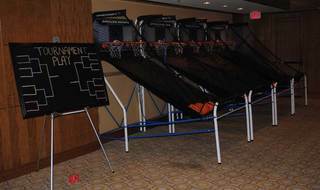 Multiple players can compete against each other tournament style using multiple machines to see who can score the most baskets. 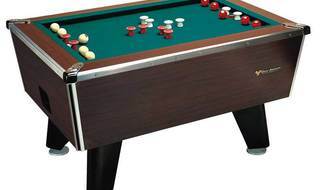 The time-honored parlor game, Bumper Pool, can be brought to your next event! Ever wished you could control your favorite NBA player on the court? So you think you know football? Our Sports Frenzy package will test your skills in competitive events themed for basketball and football. In Football Frenzy, players take control and their fitness & endurance will propel their figure down the field for a touchdown. 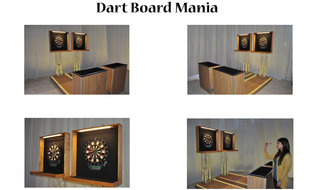 Aim for the bullseye in Dart Board Mania where we use rubber darts and host a tournament to add to the fun! A new game that combines the excitement of squash, the skill of golf, and the fast-action thrill of hockey. 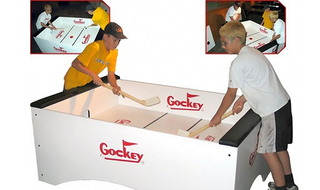 Two players rely on speed and coordination to score using short sticks and a rubberized ball. 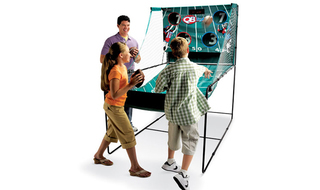 Your guests will love playing this classic arcade game! 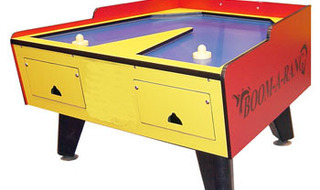 Six times the fun as regular air hockey! Goals can be blocked off for two or four player action, or leave them all open for a total of six players. Octagonal table is made from black granite laminate with 4'' square solid wood legs. Score! 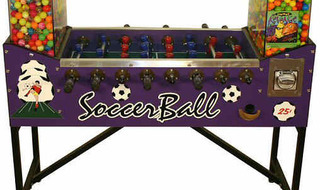 Foosball is a fast and fun competitive Soccer Ball playing game. 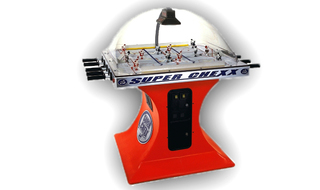 A ball is put into play and each player rotates their rods with figurines attached in order to make the figurines kick the ball into the opponents goal. What's more? The game ball is a gum ball that players can take away after their matchup! Two players compete against each other, twisting their rows of teammates attempting to kick the ball into their opponent's goal. Score! 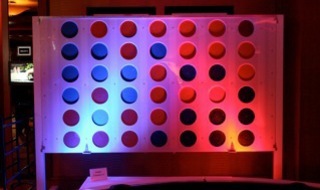 A twist on the classic arcade game adding room on the playing board for a third player! 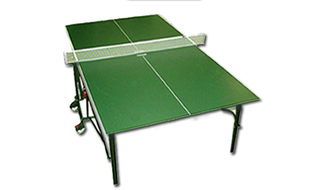 The classic parlor game, ping pong, enhanced with our custom-designed, high tech stylings! The lucite surface table is supported by durable yet chic metal trussing accented by LED lighting. 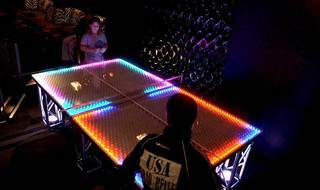 Better yet, the table is filled with ping pong balls and is fully illuminated by animated LED lights! What a unique spin on an arcade classic! The classic parlor game, ping pong, is a light-hearted game approachable by all ages! Multiple tables available. 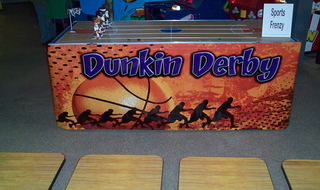 Great for kids and adults, Pop-a-Shot gives players the opportunity to test their hand-eye coordination skill. 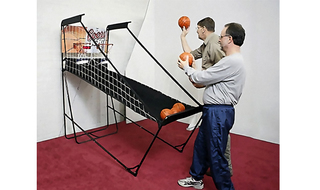 Multiple players can compete against each other using multiple machines to see who can score the most baskets. Line up your shot, take your stance, and Be the Ball...Putting Challenge allows players the chance to test their skills on the green. How good is your focus and hand-eye coordination? 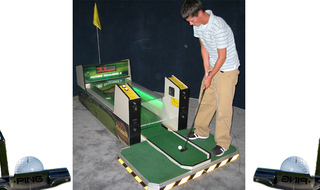 Step up to our Putting Challenge and find out! Let's see that arm! Grab hold of the pigskin and fire one into our Quarterback Pass Attack Challenge! Multiple entry points score the player based on how difficult the target is to throw through. Also available in multi-player configuration where two players can challenge each other simulatenously! 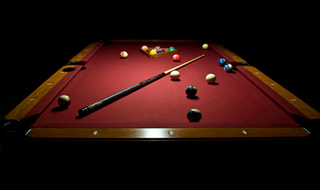 The classic game of billiards is available for your next event. 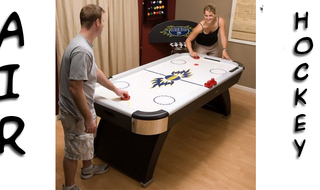 One step further, we offer custom finishes on the pool table from felt color, wood style, futuristic metals & alloys, and more! 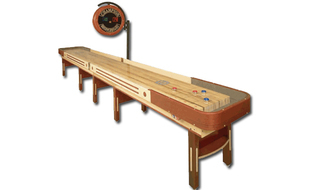 The pub classic, Shuffleboard is available for your next event! 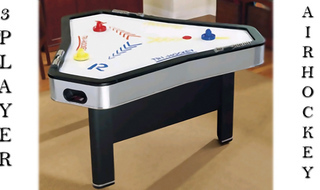 Players take turns sliding, or shuffling, the weights to the opposite end of the board, trying to score points, bump opposing pucks off the board, and/or protect their own pucks from bump-offs. Points are scored by getting a weight to stop in one of the numbered scoring areas. 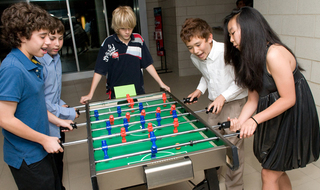 Played one-on-one or with teams, Shuffleboard is always a fun, interactive activity suitable for any event! 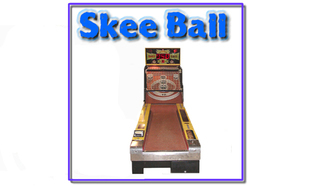 The classic arcade game, Skee Ball, is a hit at any event! Step up and compete against a friend in Super Chexx Hockey! Take hold of the handles, move and twist your figures to make a powerful slap shot through your opponent's goal!